Hi-ν Gundam kit in Ver.Ka for the first time in about seven years from the MG version of the 2007. Under the mechanic designer Katoki Hajime supervision, and realize new proportions unprecedented. Taking advantage of the expertise gained in MG ν Gundam Ver.Ka, funnel characteristic and difference, of armed and armored also reproduced with its gimmick. MG high quality and attention to detail and marking the birth. And various armed comes in abundance. Wrist adopt Emotion manipulator SP. I secure hold performance in the W lock system! - New type only MS that has been deployed in the RX-93-ν2 Hi-ν Gundam ... Londo Bell Corps. The aircraft's development of Anaheim Electronics, Inc., but Saikomyu designed by Amuro Ray Captain of the main pilot and engineer are mounted. The novel appeared in the Mobile Suit Gundam: Char's Counterattack Berutochika Children]. MS in the work arrangements greatly design of MS appearing theater version in the Mobile Suit Gundam: Char's Counterattack. 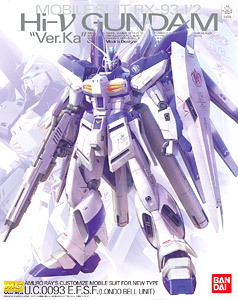 Hi-ν Gundam has become a base ν Gundam, further refinement of the design is carried out in 2007, as the official MS, it is also appeared in such games.